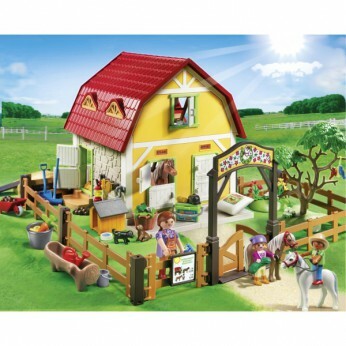 The Playmobil Childrens Pony Farm features a stable block with 3 horse stalls. The fenced area is ideal for giving your horse its daily exercise. The set includes 3 Playmobil figures, 3 horses and over 50 accessories. Build and look after your own pony farm with this fantastic Playmobil children’s set, which encourages creativity and imagination as your child creates stories and animal adventures for their favourite friends on the farm. With a stable block with 3 horse stalls and stickers to decorate there’s lots of fun to be had on this exciting pony farm. The fenced area is ideal for giving your horse its daily exercise. The set includes 3 Playmobil figures, 3 horses and over 50 accessories. Size H40, W50, D10cm; For ages 5 years and over; EAN: 4008789052223. WARNING(S): Not suitable for children under 3 years old. Only for domestic use. This toy costs approximately £39.99 (for the latest and best prices make sure you check our retailer list for the Playmobil Childrens Pony Farm 5222 above). In our review of Playmobil Childrens Pony Farm 5222 we classed it as being suitable for ages 3 years, 4 years, 5 years but recommend you check the manufacturer specific advice before purchasing.